The State CAPE Network is comprised of coalitions of state-level private school associations in the states and territories listed below. 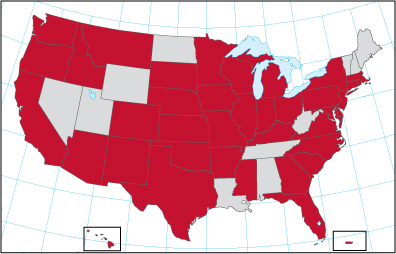 Each state coalition addresses the unique needs of the private school community in its own state. Because most issues and activities pertaining to private schools begin or manifest themselves in the states, the State CAPE Network plays a unique and critical role in helping CAPE’s Board of Directors identify, define, and clarify issues affecting private education. Membership in the State CAPE Network is open to organizations that are representative of the diversity of private schools within the state, have as their members private school organizations or individual private schools, and fulfill all other requirements of membership. State CAPE affiliates meet twice each year to network, discuss matters of common concern, provide opportunities for professional growth, obtain information about national trends and issues, and (in March) engage in direct discussions with the CAPE Board. State CAPE Network representatives select one of their members to represent the state perspective on the CAPE Board of Directors.